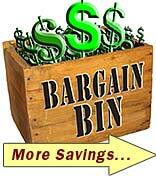 "Don't Miss our Bargain Bin pages for Closeout Merchandise at Huge Savings!" While supplies last! 24", 36" and 50" Boomer clamp system and all accessories. Act now before they are gone! SAVE $5.00! 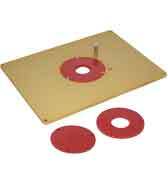 Our 1/4" thick aluminum router table insert will support the heaviest of routers, without plate sag. SAVE $4.00! 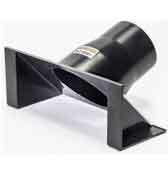 Add dust collection capability to your shop built router table fence or replace a broken port. SAVE $9.00! 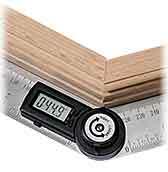 Precisely calculate inside - outside corner angles when installing crown, chair or base moldings. Don't guess! SAVE $10.00! 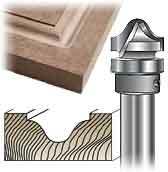 Create a perfect 52º/38º angle on crown and cornice molding. Creates perfectly opposing angles. SAVE $29! 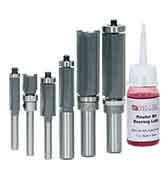 Features a variety of Flush Trim router bit styles for multi-project flexibility. Includes bearing lube! SAVE $3.00! 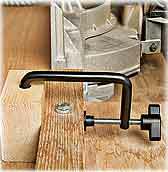 Attach a sacrificial fence, re-saw fence, half fence without clamp interference! Size is 3" - 4-1/2". SAVE $40! 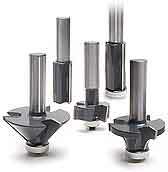 Three flute, carbide tipped - round over, chamfer, rabbeting, straight and flush trim router bits. SAVE $6.00! 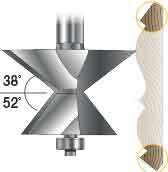 Upcut spiral bit is a good choice when chip-out is a concern with plywood, melamine or other laminates. SAVE $5.00! 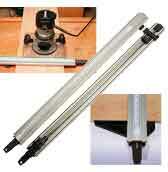 Works with standard 3/4" x 3/8" miter gauges with or without a t-slot. 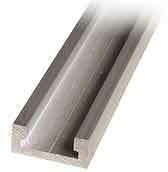 T-bar also available. SAVE $5.00! 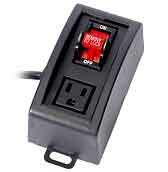 Mounts quickly, and allows safe and convenient on/off control of 120V AC routers and other tools. SAVE $5.00! Make decorative crown moldings using a 1/2" table mounted router. 1/2" shank carbide tipped bit. SAVE $10! 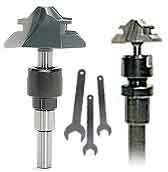 Get both 1/4" and 1/2" router collet extensions plus 3 piece wrench set. 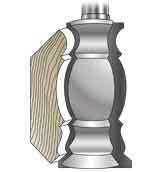 Extend your collet 2-1/4"! SAVE $5.00! Create a raised panel look on a solid door. 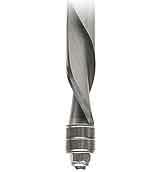 This carbide tipped bit plunge cuts, top mounted bearing.